Last night (February 10), Toronto was a cold, snow-covered city, surprisingly quiet for a Friday night. That, however, was not the case inside Adelaide Hall, where Elephant Stone and Walrus threw a psychedelic beach party from another dimension. Though differing in energy, Elephant Stone and Walrus complemented each other, building waves of tension and release, and covering the club in dense fuzz. And all night, the crowd seemed extremely positive, feeding off the rad vibes of both bands. Halifax's Walrus came out of the gate swinging with the bouncy ripper "Wearing It," making for an early highlight. It's a great tune that showcases Walrus at their best — toying with the energy of a song, speeding up and slowing down on a dime, constantly keeping the crowd audience on their toes, lulling them into a false sense of serenity, but always ready to let loose a barrage of riffs and wails. Everyone on stage was tight, making the wild dynamic shifts seem effortless, and adding to the exciting kinetic energy of the band. Lead singer/guitarist Justin Murphy's light, mystifying vocals hung above the cacophony of rhythm and buzz, with guitarist Justin McGrath's harmonies pairing nicely and adding another trippy layer. Furthermore, almost everyone in Walrus solos, and not just a little rip here and there — we're talking serious shredding from all parties, while Jordan Murphy drums circles around them. Whereas Walrus played with time and speed, Montreal's Elephant Stone went a more hypnotic route at first, playing grooves that locked listeners in with buzzing, pulsating sound. Rishi Dhir's vocals were hazy and wavy, and sounded like they were coming from another dimension, just slipping in and out of our world. Then he picked up his sitar, and everything changed. It became clear that the slow, hypnotic opening was merely preparing the audience for the night's real focal point. The energy burst out of every corner when Dhir began to play, filling the room with the instrument's unique presence. 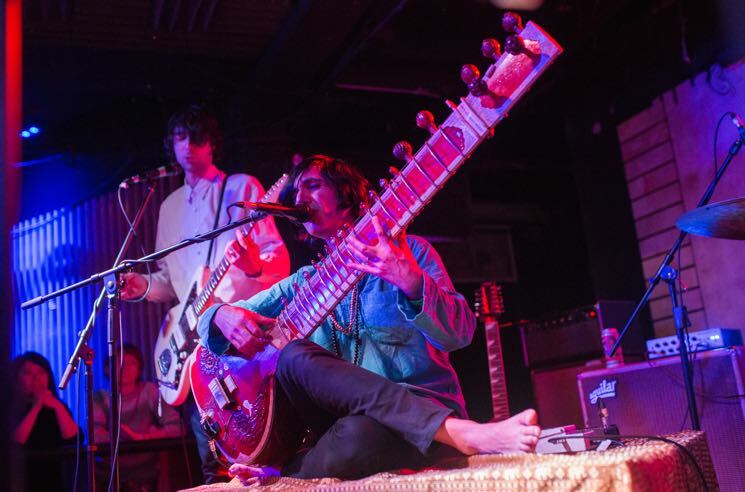 An extended sitar solo showed off the versatility of the instrument, with Dhir at times filling the entire room with the enchanting sounds of the sitar alone, breaking through the psychedelic fuzz of the rest of the band. The sitar proved a wild and nimble instrument, dancing around as the rest of the band fell back into those hypnotic grooves. But not only does Dhir crush it on sitar, he also plays some serious bass, laying down riffs and locking in with drummer Miles Dupire to help perpetuate those hypnotic grooves. Gabriel Lambert's guitar, meanwhile, spoke in squeaks, buzzes, and hums, as he let loose his supply of sonic weaponry, while Dupire kept the whole cosmic ship afloat with his constant, never-ceasing beat. The energy from the two bands, the positive vibes, the solid playing and the genuine connection they forged with the crowd was more than enough to make us all forget how cold it was outside, even if it was just for a night.